The health care industry’s impact on cities and regions—through job creation, purchasing, and real estate development—has gained increasing attention in recent years, and for good reason: The Bureau of Labor Statistics projects that by 2022 one in six new jobs will be in health care occupations, found in settings ranging from hospitals to residential care facilities. According to the Centers for Medicare and Medicaid Services, by 2023 over 19 percent of the nation’s gross domestic product will be in health care expenditures. At a time when the nation’s health care system is being upended by new policies, technologies, and demographic dynamics, these issues are more relevant than ever. Yet largely absent from the discussion is consideration of how the physical character of urban health centers, and the relationship they in turn have with their surrounding neighborhoods, could be more supportive of expanded and evolving ideas for what it takes to build a healthier society. Look around the large urban academic medical campuses where much of our nation’s care is provided and studied, and you see a starkly similar, and fairly depressing, spatial form: large-scale, inwardly focused buildings, ample parking, and scarcely any people in site. While these centers may be embedded in the urban landscape—and are often only a stone’s throw from busy downtowns or commercial corridors—they are rarely enmeshed in it. Though their economic connection to their city and region may be important, it’s fair to say that their corporeal relationship is barely tangible. The ramifications of this disconnection are pretty apparent, if not yet precisely measurable. At the same time, their fortress-like settings make them unwelcoming to those living or working around them. The huge number of employees, outpatients, and visitors, combined with other local residents and workers, should provide a substantial market for commercial activity, health- and wellness-related programming, and other cultural amenities that would help integrate hospitals into their communities in ways that directly promote a more holistic social mission. But in most medical centers, this potential remains hidden behind tinted glass doors. Finally, the self-contained nature of medical campuses inhibits interaction among and between clinicians and researchers, potentially curtailing the exchange of ideas and collaborations that spur and nurture innovations in preventing, diagnosing, and treating injuries and illness. A recent Project for Public Spaces (PPS) survey of health workers in the Oklahoma City health sciences center—a classic example of the model described here—found that there were far fewer spontaneous interactions there than in dense Kendall Square, in Cambridge, Mass. Yet when they did happen (albeit most often in internal cafeterias) they were highly valued just the same. In recognizing this challenge, stakeholders in Oklahoma City are embracing the opportunity these findings present as they think about how to evolve their health care and research campus into an 843-acre innovation hub. The emerging district encompasses the campus as well as Automobile Alley, a lively commercial corridor that’s grown up across the highway. Through work with Brookings and PPS, district leaders hope to develop a unified vision and specific strategies for integrating innovation, placemaking, and inclusion in ways that make the area more vibrant and bolster it as a driver of regional economic growth and opportunity. Similar efforts in Buffalo, N.Y. and Austin, Texas are also focused on remaking medical campuses in ways that benefit adjacent communities while facilitating innovation and firm growth. The Wake Forest Innovation Quarter in Winston-Salem, N.C. looks to be there already. A growing campus for research, business, and education in biomedical science, information technology, clinical services, and advanced materials, the Quarter is home to more than 60 companies and four leading academic institutions—including the Wake Forest School of Medicine—with more than 3,000 workers and 5,000 students. Health and wellness is also a major focus of the Quarter, motivating the creation of the 1.5-acre Bailey Park, a public space actively programmed to serve the Quarter’s tenants as well as the surrounding residential neighborhoods. Along with outdoor movies and concerts, Bailey Park offers yoga and fitness classes, in partnership with the YMCA, and a number of walking, running, and bike events that are all free and open to the public. In addition, vendors and retailers offer healthy foods in a number of venues, including a new public market hall that is intended to provide business opportunities for food entrepreneurs. On any given day, an array of other community activities, lectures, and classes are happening throughout the Quarter. The opportunity for other medical centers to follow suit is enormous: a recent report released by Revista estimates that $97.1 billion in large health care real estate construction projects were either under construction or in late planning stages at the end of 2015. As these campuses expand into urban space, they, too, ought to be thinking about the physical form that growth takes, and how it can be shaped in ways that embrace and promote a more expansive, inclusive notion of health and well-being. 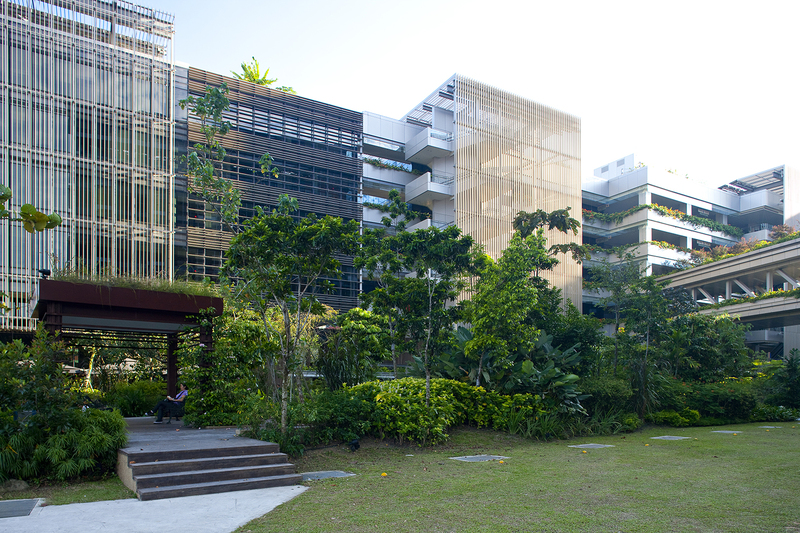 Khoo Teck Puat Hospital in Singapore combines the therapeutic properties of nature with innovative, patient-friendly design that includes lush green grounds, eight rooftop gardens, and an open environment that engages the surrounding neighborhood. Editor’s Note: Wexford Science and Technology LLC, the developer of the Wake Forest Innovation Quarter, is a donor to the Brookings Institution. The findings, interpretations and conclusions posted in this piece are solely those of the authors and not determined by any donation.